Starting the week of April 11 and continuing for approximately four weeks, Dulles Corridor Metrorail Project crews will continue steel work on the Silver Line's Centreville Road bridge. 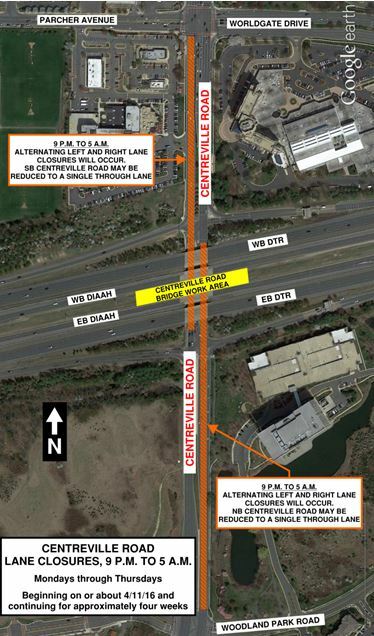 The work will take place Monday through Thursday from 9 p.m. to 5 a.m. To ensure the safety of drivers, pedestrians, and bicyclists while work is taking place overhead, alternating lane closures will occur on northbound and southbound Centreville Road. Police and flaggers will be on site to ensure public safety. Drivers are asked to use caution and remain attentive to all signage, barricades, and adjusted speed limits. Large, slow-moving vehicles may be exiting and entering the highway at various times. Please remain alert as you pass through the construction zone.